From left, Eagle County Sheriffâs Office Sgt. Tim Comroe, Deputy Jake Best and Undersheriff Mike McWilliam with Starting Hearts board member and former Deputy Chief of the Vail Fire Department Mike McGee, Starting Hearts founder Lynn Blake, Starting Hearts Executive Director Alan Himelfarb and Vail Valley Medical Centerâs Emily Tamberino. Thanks to a partnership between Starting Hearts and Vail Valley Medical Center seven automated external defibrillators were recently placed in Eagle County Sheriffâs Office patrol cars. VAIL — While sudden cardiac arrest is the nation’s leading cause of unexpected death, only 1 out of 35 Eagle County Sheriff’s Office patrol cars was equipped with an automated external defibrillator — until now. 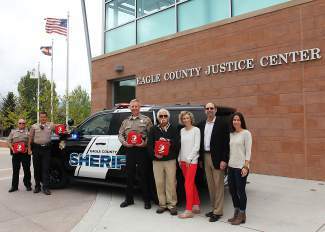 Thanks to a partnership between Starting Hearts and Vail Valley Medical Center seven defibrillators were recently placed in Eagle County Sheriff’s Office patrol cars, with the intent to save lives. This signifies a big step in making Eagle County the safest place in America to experience sudden cardiac arrest. Patrol deputies provide law-enforcement services 24 hours a day, seven days a week to the residents of unincorporated Eagle County and are often first on the scene of medical emergencies such as sudden cardiac arrest. In addition to receiving the seven new defibrillators, the deputies and staff are being trained in compression-based CPR and how to use the defibrillators in an emergency situation. The partnership between Starting Hearts and the medical center has been instrumental in transforming Eagle County into a model community for saving the lives of sudden cardiac arrest victims, and extending access and education to the Sheriff’s Office is an important milestone in the process. The medical center has committed to adding 50 additional defibrillators in accessible, highly trafficked locations, bringing the total number in Eagle County to 350. The partnership between the hospital and Starting Hearts is made possible by a generous donation to the Vail Valley Medical Center Foundation. Starting Hearts founder Lynn Blake believes that placing defibrillators in the Sheriff’s Office cars is vital to accelerating response time for sudden cardiac arrest victims and will save people’s lives. The Eagle County Sheriff’s Office has embraced the defibrillators and training as tools to help them achieve their mission. The cars receiving the units will be marked with a sticker designating them as defibrillator-equipped. According to Van Beek, the addition of defibrillator units in patrol cars will be important for patrollers servicing the entire county. The defibrillators will be placed in patrol cars stationed in more remote parts of Eagle County and along the Interstate 70 corridor. Given the positive response from the Sheriff’s Office, Van Beek said, they plan to equip more patrol cars with the devices. “We are expecting to train our Deputies and have (defibrillators) in all patrol cars over the next few years,” Van Beek said.